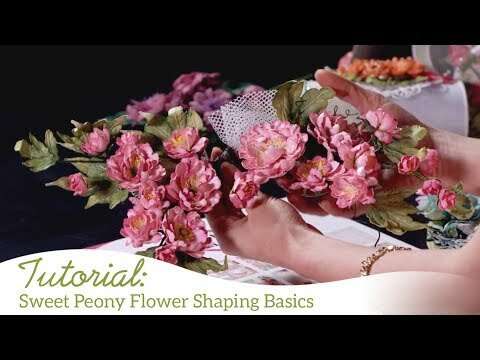 For more tips on creating with the Sweet Peony Collection watch the tutorial at http://hcgo.co/SweetPeony. 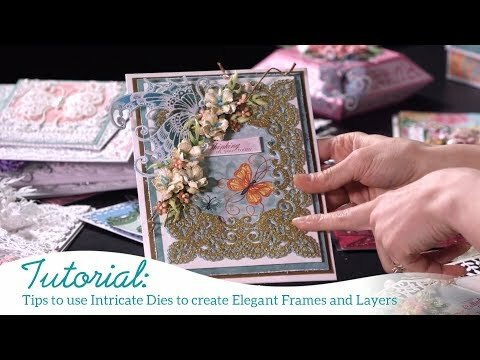 Instructions: Create card base using white pearlised paper and Eyelet Rectangle & Basics Die. Cut a piece of paper from the Butterfly Dreams Paper Collection 5 using the Eyelet Rectangle & Basics Die and adhere to the card base using Dries Clear Adhesive. Cut the Frame a Card Leafy Borders Die from paper collections two times to create a beautiful Rectangle and adhere to the card base using 3D foam tape for dimension. Stamp the Large Sweet Peony Cling Stamp Set on foam paper with Ranger Archival Ink Pad - Plum and cut using the coordinating dies. Colour with Gallery soft oil pastels 209. You will need 2-3 petals for each flower to create flowers. Stamp the leaves using Classic Rose Vines Cling Stamp Set on the white paper with StazOn Ink Pad - Olive Green, cut out with the coordinating die, shade use this same ink and shape. Adhere the flowers and leaves to the card using a hot glue gun.